I really enjoyed our trip to Norway, it was something I’d wanted to do again for donkey’s years, and often when you’ve looked forward to something so much it can be a wee bit of a disappointment. But Norway lived up to my expectations, I don’t suppose the fjords ever change, except when some more scree falls down the mountains, just making it even more scenic than before. As ever, the food on the cruise was excellent, but luckily we were able to go for long walks when we got off the Black Watch, we were just about the only ones to do that, although one couple did hire bikes to travel up to the lakes at Flam. The cruise started off from Rosyth though and we were lucky enough to be the first cruise ship to sail under the newly completed Queensferry Crossing which was being officially opened by the Queen the next day. 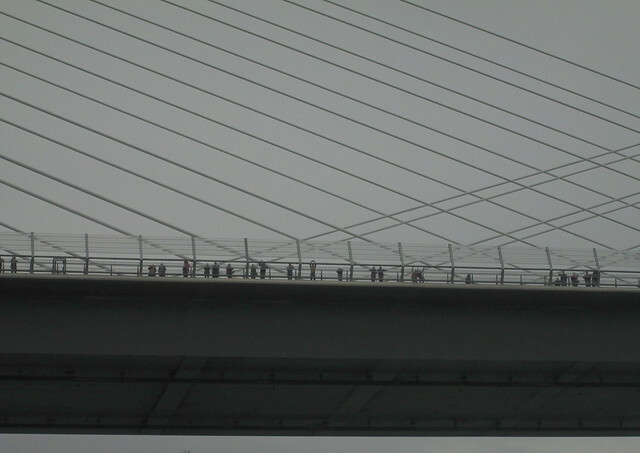 It had been closed to traffic to allow 50,000 people to walk across the bridge over the weekend, it’s not a pedestrian bridge normally. There was a lottery for the tickets so as you can see there were people waving at us as we sailed under the bridge. The bridge isn’t open to pedestrians at all now so that was a rare opportunity for them – and for the passengers who were out on deck waving back to them, quite emotional really. All going to plan tomorrow’s post will be in Norway! 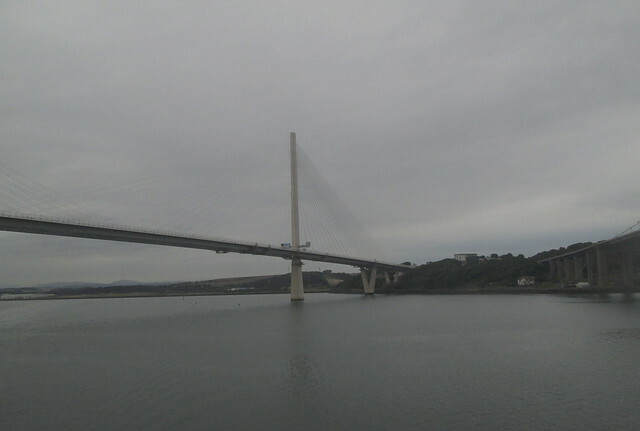 This entry was posted in Bridges, Personal and tagged Queensferry Crossing by Katrina. Bookmark the permalink. How very exciting and lovely to be aboard the first cruise-ship to sail under the new bridge – there would be a distinct sense of ship’s passengers and pedestrians on the bridge all wishing each other well, I’m sure. You sailed on the Black Watch before, I think? You’ll be old hands aboard! It was strangely moving to be able to wave back at the people on the new bridge. Yes we felt quite at home on the Black Watch although it was a wee bit different as parts of it had been re-furbished. What a unique and special beginning to your trip. Looking forward to hearing more. And welcome back! Thanks, I’m glad to be home and sleeping in my own bed! So glad you’re back after a wonderful trip! Missed you a lot. Sadly we didn’t sample any food in Norwegian restaurants, they feed you too well on cruise ships! But Norwegians seem to like a lot of fish – not my favourite food.